A huge gate with the image of Ardhnarishwara – the amalgamation of male and female form in Lord Shiva at the centre top forms the backdrop of main stage of Kinner Akhara at the Kumbha nagri in Prayagraj. 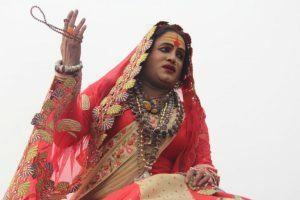 Seated at desert tent guarded with armed police and hefty bouncers, kinnar akhara Mandaleshwar Laxmi Narayan Tripathi with saffron chandan smeared on forehead, Blood red colour lipstick and heavy rudraksh beads around her neck was seen cuddling a baby of her visitor who came seeking her blessing. Tripathi is a celebrity transgender was seen blessing a constant stream of pilgrims at the ongoing Kumbh Mela. Ending all speculation, it was the first time kinnar akhara was allowed to take a holy dip or Shahi Snan along with the other 13 akharas. Initially the organising committee refused to accept kinnar akhara as the 14th order of the traditional akharas. Due to close bonds with the Juna Akhara of Laxmi Narayan, they merged and agreed to bath together. Kinnar akhara is the crowd puller and main attraction for pilgrims this time. Kinnar akhara is brimming with people wishing to pay respects. Foreign visitors also throng this akhara out of curiosity. Devotees were seen making a beeline for getting blessed by them. Talking to a pilgrim, Rekha Varma says, “The scared rice given by them to us brings success and prosperity in life. We were thrilled and excited to meet them.” Her family believes that a coin pressed by a kinnar’s teeth given to them also brings prosperity and peace in life. Laxmi Narayan Tripathi supports the construction of Sri Ram’s temple at Ayodhaya. She had to face condemnation from her LGBT community for supporting it. While talking to her on Ram Mandir issue she says, “Lord Sri Ram was born there and the temple has to be built in Ayodhya. Our Dharma is to accept all. 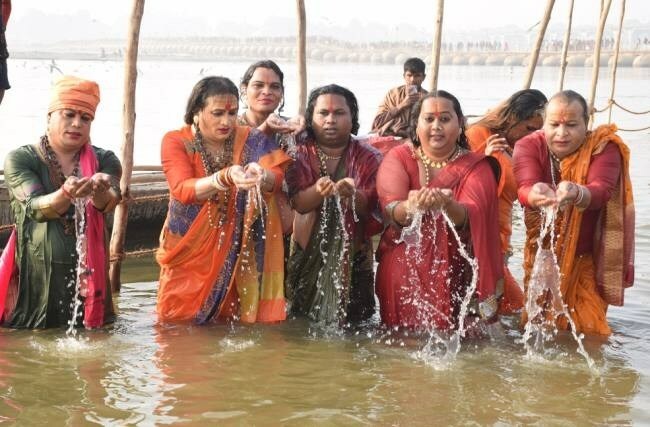 We will also sacrifice for it.” Further she said, “In 2015, we campaigned to have hijras represented at the first Shahi Snan of the Kumbh. The main reason of forming kinnar akahara is to re-establish hijras back in our Sanatana Dharma. After the collapse of hijras, no one bothered to give back our status by accepting us in our Dharma. I wish the soul meaning of Satya Sanatana Dharma should enlighten our society. To respect and accept everyone’. Kumbh 2019Her perception on Kumbh she said, “Who would not be excited to be a part of historic Kumbh. I had never thought that in this life I would be a part of this huge religious congregation. When I wore saree I had never thought I would have an existence of my own. The society that took away my basic rights as a human being would treat me so well. They showered love and respected me. God’s will is most powerful and God is with those who are put to test. When gold is put under pressure it shines brightly similarly, kinnar society is like gold’. She plans to spend rest of her days at Kumbh at her Akhara receiving her visitors.